"If you haven?t heard the news already, there are many exciting new developments coming up for Star Wars? 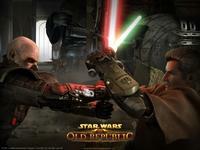 : The Old Republic?, new Operations, new Warzones, new custom items, and new ways to play the game. Plus, Game Updates will be coming more frequently. " If you have an extra couple minutes, stop by the Media section of SWTOR.com where they've added a number of new screenshots. Let's not forget that this week brought us the Grand Acquisitions Race event. Here' are the accompanying preview videos for those who missed them. Rounding out our news from the official SWTOR site we have a new Dev Tracker Summary, your weekly Community Round Up and a reminder of Tuesday's scheduled maintenance. Examiner.com reports on some of the goodies to be found in the Grand Acquisitions Race in a couple different articles. Carol Pinchefsky at Forbes.com wasn't overly impressed with TOR's presence in EA's GamesCom press conference. Click here for the write-up that includes video of the press conference. IGN.com examines what the free-to-play option will mean to SWTOR as the MMO progresses. And finaly, MMORPG.com takes a look at The Old Republic's new free-to-play option and what it will mean for the industry in general. September 27, 2012 SWTOR Game Update 1.4: Terror From Beyond Is Now Live!